There was a lot, i mean a LOT, going on in April that easily leaked into May as far as crappy negative situations could go. I’m on a major deadline with a company called Kingstone Media, and getting some creator-owned work done when i hear my brother is in the hospital with a brain injury. The “why’s” and “how’s don’t really matter, but nevertheless, i had to break away from the table to go see my baby bro. After traveling long distances back and forth to see him, my work time is getting cut into because of wedding stuff…..
And things that have to have my artistic touches there need me to let go of the deadline for the night. Then tastings galore and dee-jays and photogs… Then running back and forth to my fiancees home…..
And then my brother leaves the hospital. His first thing to do after a brain injury…..
GO SEE CAPTAIN AMERICA: THE WINTER SOLDIER. WHICH I STILL HAVENT SEEN YET. Trying to catch up with work while things start to die down and then another BOOM :…..
My mom is in the hospital now. Even DIES for a couple of seconds on the table in the Ct Scanning room. Now my brain is shut down. My other obligations are on the backburner at this point while I’m privately freaking out inside myself thinking to myself how i’m NOT READY TO LOSE MY MOM…. Lord, Don’t take her home yet. Not the Upper Room. She has to see me get married first. I said that about my grandmother for years. That she couldn’t go to the Lord until i got married. It was a semi-joke, of course…. But who thought i’d be dealing with back to back family members going to the same hospital two weeks apart from each other? Or that i’d be talking to my 92 year old grandmother about her daughter in the hospital after years of my semi-joking about not losing her? I needed a mental break. I put everything down. Knowing my deadline was looming. ….. Seems to have gotten his hands on a dream book of mine. the Futurians. 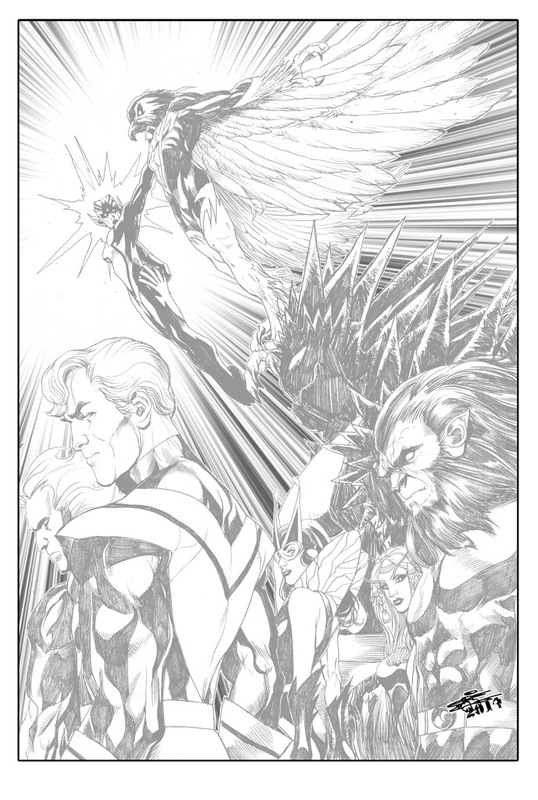 Dave Cockrum’s superteam fresh from the X-men and Legionnaire’s thought process, in my opinion…. And Meth was getting high powered artists to donate art to the project in honor of Cockrum. To those who don’t know, Dave Cockrum was the legend that created the New X-men… A team that comprised of Cyclops, And new additions and the first appearances of Storm, Banshee, Colossus, NightCrawler, Wolverine (Fresh from his own debut in the Hulk) and ThunderBird. And Cockrum recreated the now iconic looks for all the characters. Well this man created The Futurians. And when he got sick and then died, i wanted to own the IP to do the Cockrum name justice and really push his characters into the forefront. It appears that i was beat to the punch. I wanted to escape my present mental freeze so i stayed off the project I’m working on and chose to do a pinup for Meth and join in with other artists who were going to do The Futurians concept proud. So i hit Meth up and told him i was joining in …..
And escaped long enough to produce this….! The great Bob Wiacek is going to ink this. I cant wait! When he does, I’ll post it here. In other news, my mom is home but not totally out of the woods… But improving. And that one pinup jumpstarted my brain again. Btw. I still want this IP. Very beautiful artwork, Chris. I look forward to seeing the inked version. As a huge fan of Dave Cockrum’s work, I’m definitely excited about Clifford Meth’s project. On a more personal note, I wish you the very best in all aspects of your life. Congratulations on your upcoming wedding. I hope that your mother is able to be there. And I am glad that your brother got out of the hospital. Thanks, man! All things progressing. I hope all is well. Take care.